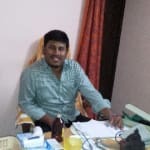 Dr. Nagarajan S is a popular ENT Specialist in Ottiyambakkam, Chennai. He has over 8 years of experience as a ENT Specialist. He has completed MS - ENT, MBBS . He is currently associated with M V CLINIC in Ottiyambakkam, Chennai. Save your time and book an appointment online with Dr. Nagarajan S on Lybrate.com. Lybrate.com has a number of highly qualified ENT Specialists in India. You will find ENT Specialists with more than 37 years of experience on Lybrate.com. Find the best ENT Specialists online in Chennai. View the profile of medical specialists and their reviews from other patients to make an informed decision. For cleaning ear wax ,which department should I consult.In a period of how many days ,it's said to clear ear wax. Hello, It's a very good question. Ear wax is formed in all the people but in few it gets deposited and needs removal. The ear buds and other similar items are useful to mop the ear from discharge but not for wax. The requirement for wax cleaning depends upon patient to patient and it's generally around 6 months. ENT doctors are well trained in this procedure. Wax can be cleaned with a hand held instrument or by syringing in the ear or through vacuum pump. Take care. I am suffering from sinusitis from last few years and its panic I have consulted many doctors but it is still not cure. please suggest some thing. Hearing Problems - Treatment Options For It! Removal of Wax Blockage: Ear wax that accumulates in the inner ear canal is a common cause for temporary loss of hearing. In such cases, cleaning the ear wax can help restore hearing. This should not be attempted at home as damaging the ear canal can result in a permanent hearing loss. To remove the ear wax, a doctor will need to loosen it with oil and then suction out the softened wax. Surgery: Loss of hearing caused due to a traumatic ear injury can be treated with surgery. This usually involves the insertion of small tubes to help fluid drain out of the ear. This surgery may also be beneficial in the case of temporary loss of hearing caused by recurrent infections. Behind the ear hearing aids – These are large, powerful hearing aids that are used to treat severe loss of hearing. In the ear hearing aids – These are small hearing aids that fit within the outer ear and can be used to treat mild to severe loss of hearing. In canal hearing aids – These are very small hearing aids that fit inside the ear canal and are thus not visible from outside. They are used to treat mild to moderate loss of hearing. Cochlear Implants: Severe hearing loss caused by irreparable damage to the inner ear canal can be treated with a cochlear implant. This works by amplifying sounds and transmitting them to the auditory nerves while bypassing the damaged ear canal. A cochlear implant needs to be surgically inserted behind the ear and can be used by children and adults. Cochlear implants have been successfully used to treat people who were born with a loss of hearing. In case you have a concern or query you can always consult an expert & get answers to your questions! Gm sir/maim, my self a branch manager A public sector Bank. I am suffering from tinnitus problem in my right ear. I visited ENt they prescribed Audiology test. Report has reflect range 36.66 PTA dbhl of right ear. Please prescribe me for any scope from come out of whisil sound. Too much worried with whisil. Someone has told it will life long how can it possible our science has a lot of developed. Whether transplantation be possible of weak nerve. 15 days before it range was 47 it seems improve. Having medicine for strange of nerve. Please guide us to come out with anxious and irritating gesture. Humming sound, whistling and giddiness are the problems which are getting in people are very common these days, these get complicated when they are not taken care of at proper time whistling or buzzing in the ear is getting commoner these days in people of all ages. Most common causes is wax or any object in the ear, after getting your ears clean these gets over. But if ears are already clean than this is worrisome. Common causes which are responsible are high cholesterol diet, alcohol, smoking, loud noises, cervical spondylosis, trauma (self or inflicted) over the ears. If this is the situation than report to your ent doctor immediately tinnitus is basically due to hampered blood supply to ears due to which ears start dying. As this process starts a person starts hearing noises. When a person starts hearing noises then it is already late diagnosis as these noises gets heard by someone when they are of 40 db intensity, below that threshold these noises are not heard. So it is already to late and the damage has become permanent. Problem with these noises are that we can control at what level person goes to his specialist otherwise these noises keep on increasing and can give you headache frustration and depression. Now a days tinnitus maskers are available which help you to lead your life peacefully. My son is suffering from adenoids n tonsil. He is just 5 years old. Doctors recommended for adenoidectomy. Surgery. Let me know how safe is this surgery in future prospects and what all precautions to be taken care present n future. In how much time he will recover n sent to school. Adenoidectomy with tonsillectomy is s safe procedure and complications of surgery are very rare. Usually post operatively after a week no major precautions are required and he can be sent to school after a week. I have snoring nose. I have consulted many doctor. But no use .what should I do doctor. Snoring is caused because of a vibration of the soft tissues of the upper airway. It is usually due to her uvula and Naso pharyngeal floppyness. You should see a doctor to rule out a disease called sleep apnea syndrome. There are a variety of treatments for this condition including surgery and 'cpap' usage. However it is decided after a sleep study. In the meanwhile you co uld follow some of the following suggestions. 1. Sleep on your side or tummy. 2. Do not take alcohol See your ent specialist for more. All the best. Respected sir from last 2 days I am feeling dizy and headache and stomach feels like burning and having sore throat. I have a blocked left ear since the past 2 days, it was hurting some initially now its not. Dont have cold, seems like something minor but i cant put my finger on it , please guide? Please get an ear examination done to have a diagnosis and treatment of the ear condition ( whether due to impacted wax or due to some middle ear condition or some other pathology ). Dear Sir, I am having mild throat irritation and foul smell and taste from my throat. I feel like there are some thing in my throat while swallowing. But I never feel trouble or pain while swallowing anything. I am also having severe head ache and sometimes my eye burn with head ache. This all symptoms are there from last 3 months and not getting cure with antibiotic also. Please tell me what I am going through? Thanks a lot. Dear lybrate user if it not clear by using antibiotic, then it might be acidic one, basil seeds are very good. Soak some basil seeds in water for some time and then have it with cold milk or any natural drink. The best known substance that reduces is sabja seeds, also called as tukmaria. Sabja seeds are soaked in water for sometime and added to milk with rose syrup reduce intake of salt, hot spices, oil, fried foods regular meal time especially lunch at noon. Reach for a glass of water. Your headache may be a symptom of dehydration. Try 1-2 drops of lavender, peppermint, or eucalyptus essential oils in 1 teaspoon of almond oil. Massage into temples. Deep breathing for at least 10 minutes provides relief. Steam inhalation thrice a day take homeopathy medicine nux vomica 200 at night daily for 6 days revert back privately thanks. I can't hear properly but I can hear all the little sound near me but when someone talk to me there voice can't get clearly into my ears what's the problem? Hi, Lybrate user, get it done Audiometry test to rule out your problem. It would give information about your hearing status. Thanks.